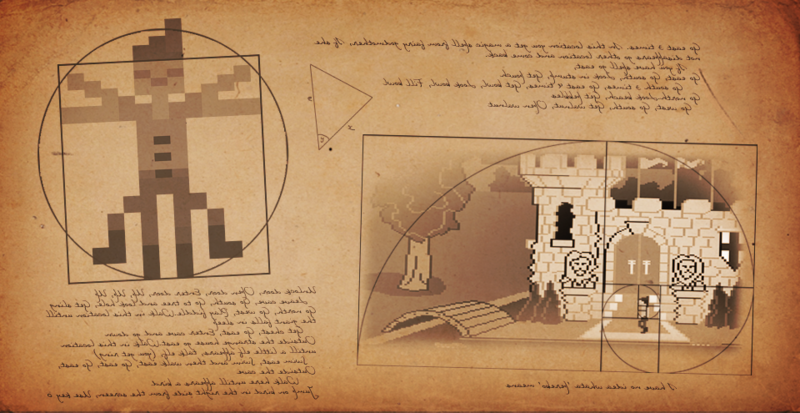 Acclaimed artist Ben Chandler shares his expertise in designing adventure game graphics. 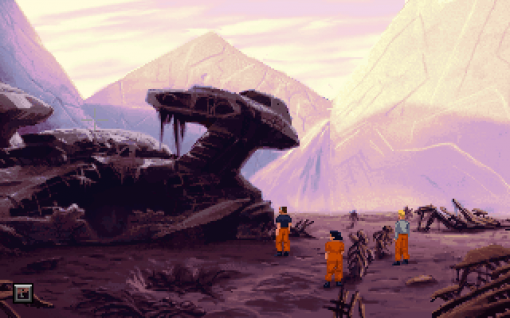 The primary purpose of background art in adventure games is to be part of the gameplay. It's where the locked doors, the mazes, the inventory items appear; it's where the characters have to walk around, jump across, and swim through. 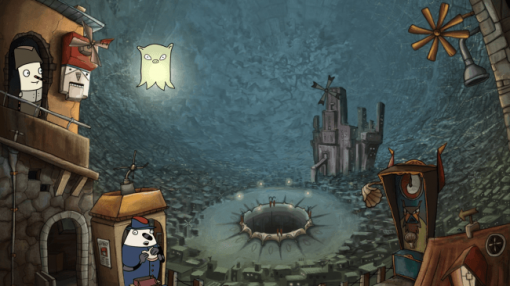 Beyond the realm of playability, however, are the distant areas – those non-playable parts of the scenery that allows the writers and artists to convey their world and story. These elements often rely purely on visual impact, rather than factoring into the actual narrative beyond being pure setting, but their effect on the feeling of a game is no less potent. When working with Dave Gilbert on The Blackwell Epiphany, one of his goals was to open the usual 'offices and apartments' setting of the series up a little, and give me a chance to create more evocative, scenic locations. The first area in the game was a fun example of this: we had an old apartment building, ruined to the point of being utterly condemned, and this allowed us to break big holes open in the walls and show the cityscape beyond. The scene here is fairly typical of earlier Blackwell games – a character to talk to, a doorway to exit out of, and an object on the ground – but the massive hole in the wall let us to make this something else, something more memorable. When working on Technobabylon, it was important to both James Dearden and I to once again show the city. 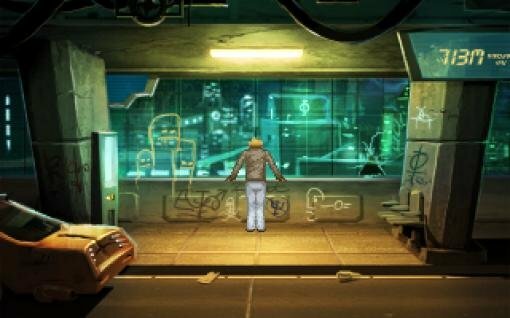 The cyberpunk genre relies quite heavily on setting as a storytelling element – it's the sort of genre that feels 'right' when set in the dirty alleys and neon glow of a big city. We used gaps in streets and elevated locations with large windows to let the city be an omnipresent element, even in fairly simple backgrounds. It was satisfying to create a range of corporate logos and billboards to help establish the idea that this is a city in which one could buy almost anything. 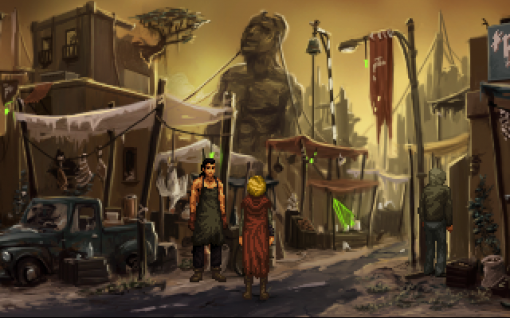 When working on Shardlight, I had a very different setting to convey. This was no longer a thriving, powerful city, but a remnant of one, more in ruins than not. Here the backdrop was a chance to tell the story of what happened to this world, and show the ruin directly. The half-toppled statue in the backdrop here, for instance, suggests the destruction of a once mighty power, with the cables and ropes connected to it suggesting the desperate attempts to save it – clearly not entirely successful, but nevertheless hanging on as best as they can manage. In this way, distant details can exist as a sort of metaphor for the setting's backstory, and exist as the scars or trophies that serve as evidence of a history. Sometimes it's useful to show distant details in order to convey a very specific piece of information. 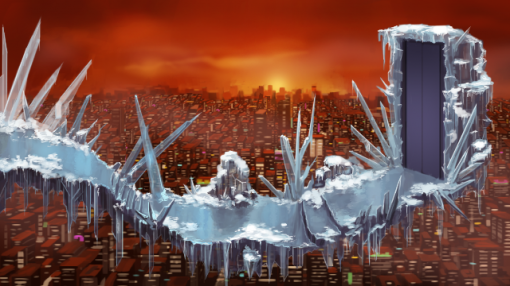 In this scene from Unavowed, players find themselves on an icy walkway far above the city. Here the backdrop helps convey that sense of height, and while it would've been possible to paint the same scene mostly just showing the sky, having so much of the city in the shot helps to sell the idea that we're high above it. In this case, our eye measures the distance by comparing the height of these details, and informs us how far such details are. It's a fundamentally useful element for specialist cases such as this. 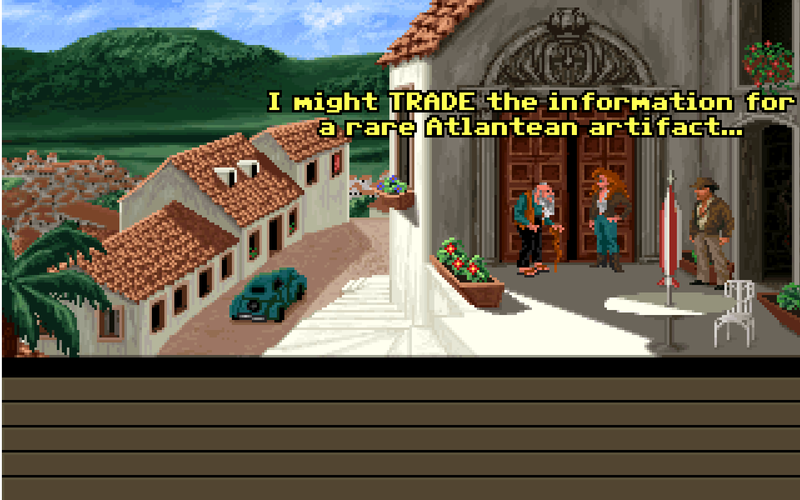 There's some great instances of distant details in classic adventure games. This shot from Indiana Jones and the Fate of Atlantis is an excellent example. In the scene, we can really do very little in terms of gameplay; it's largely just conversational. The use of different levels of buildings helps to sell the idea of a city on a hillside, and though we only talk here, the scene is nonetheless interesting and visually striking. It would've been easy for this exact scene to be shown as a single wall and doorway, with a car nearby, showing how much opportunity such a simple scene in terms of interactive elements affords the artist. Beneath a Steel Sky is a prime case of a game that loves to use distant details, and has helped inspire some of the situations in which I've used raised walkways and large windows to let the city into a scene. Here a simple industrial setting is taken to another level of visual impact by showing both the subtle details of the level below us, and of the city beyond the structure we're in. Because we only have to move around in a very small section of the environment, and because the camera angle is quite high, we're shown a lot of the city in many otherwise quite basic scenes. 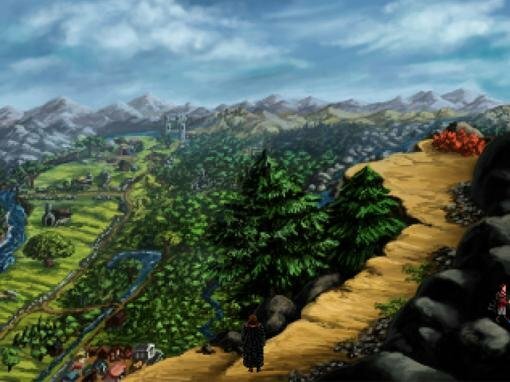 A favourite technique of artists is to use scenes such as this backdrop from King's Quest V to act as a sort of playable establishing shot. Because of the size of characters in adventure games, it's not really possible to fully convey the sense of scale of a large castle while putting the character next to it, so showing it in the distance, with a path leading up to it, helps to give us both a sense of scale and a warning, letting us know that we're approaching something foreboding, something dangerous. Because of the lesser detail in distant features such as these, bold shapes work well. Whether it's the sinister appearance of the castle in the previous shot, or the obviously alien peaks in the distance of this scene from The Dig, the effect works especially well when the information is conveyed very simply. There's no way to mistake the angular, patterned forms of the details in the distance here for naturally occurring Earth mountains, or structures made by humans. They help reinforce the story told by the unusual craft evident in the foreground – we're in a strange place, surrounded by unusual things. Other than bold shapes, the other thing that works well to help give a sense of scale is juxtaposition. The distant dam in Inherit the Earth is made larger and more impressive by being surrounded with small trees. These are given their own sense of scale by being placed behind larger trees in the foreground. Our eyes are good at measuring comparisons like this, and it helps us to judge how big something is. This particular shot also showcases a juxtaposition of eras: a leftover relic of contemporary man-made structures in a futuristic world that had been, until this point, more reminiscent of a medieval fantasy populated by anthropomorphic animals. Having a distant element emphasized like this is quite striking. The fort looming above the beach in this scene from The Curse of Monkey Island makes for an imposing structure that stands out clearly among the trees and sand of the foreground. Much like the castle shown earlier, showing it at a distance like this helps conveys the size clearly – and even though here it's just a faraway element, rather than our destination, the visual effect is still powerful. While juxtaposition is one effective way to do distant details, repetition shouldn't be discounted either. 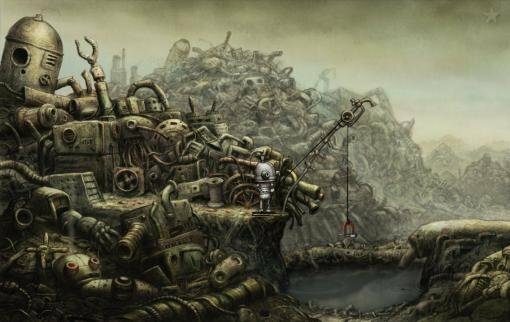 This scene from Machinarium uses repeated elements to create a different sense of scale – not the scale of a single element, such as a castle or fort, but instead the scale of an entire area, stretching back as far as the eye can see. The cluttered, detailed texture of these piles of scrap prevents any one element from standing out or being distracting; instead they make for a consistent, recurring idea that helps us establish a place within our minds. This consistency is the key here, rather than the sense of detail. A great example of consistency in distant details being more important than clarity is seen in this shot from The Dark Eye: Chains of Satinav, in which we can clearly perceive rows of trees ascending the mountain, despite the fact that they're rendered in much less detail than the trees close to us. The fact that the trees are consistent in shape and colour with both the other trees in the scene, as well as what our experience causes us to expect from trees, means that we can quite easily parse the details suggested in the distance here, and fill in the gaps ourselves. It's more important that this scene shows the uniqueness of the foreground details than the background ones, simply because we already know what those background details are supposed to represent. In The Inner World, however, things are slightly different. Rather than being something we've seen before, here we're presented with a world on the inside of a sphere, rather than the outside, and so the background artists have to make use of the distance here to try to convey this unorthodox idea. It's not the sort of thing that's easily expressed in two dimensions up close, and therefore each 'skyline' presents an essential opportunity to reinforce what this bizarre setting looks and feels like to us. Distant details, then, are a useful element for the adventure game artist. 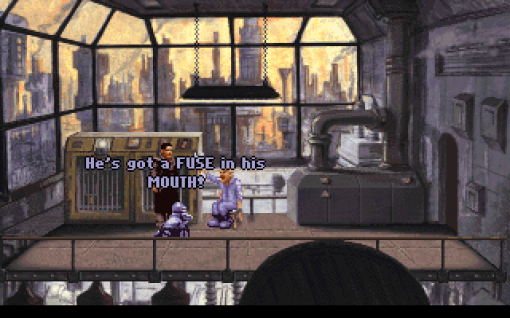 They're largely secondary to the more essential aspects of an adventure game background – the doors we unlock, the paths we tread, and the miscellany we collect – but in terms of establishing the feeling of atmosphere, they are just as powerful. They can tell us of a setting, help us to understand the size of something, or simply make a fairly plain scene much more interesting. 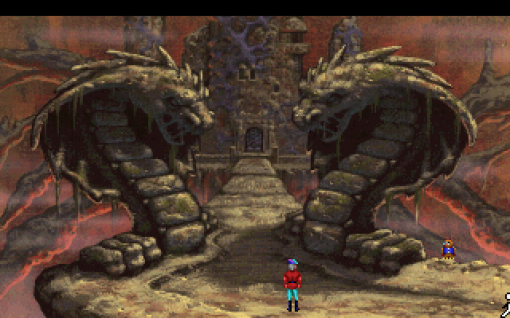 Greatest of all, perhaps, as in this scene from Quest for Infamy, is their ability to showcase a land and its features, and beckon us forth to explore it. This is, after all, an adventure. 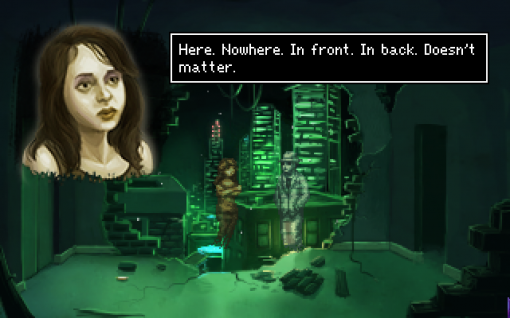 Ben Chandler is an acclaimed adventure game artist and designer who now works with Wadjet Eye. If you enjoy his freelance article series at Adventure Gamers, we encourage you to check out his equally insightful blog about art in games. Looking forward to Unawoved, I hope it comes out this year. 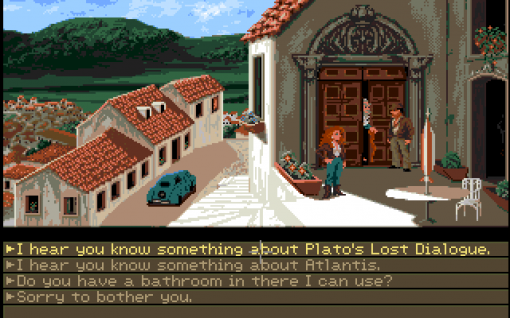 I think that last sentence, of worlds that exist beyond what we see on the screen, is something that you touch upon on this post and is related to my fondest memories of playing older Adventure Games. There’s something about the fact that we’re often stuck in the same scenery due to not resolving a puzzle that makes you start to see all the tiny details within the background. And because of that, the story they tell, or the things they imply, often gave me fuel to wonder about these worlds I was adventuring in. 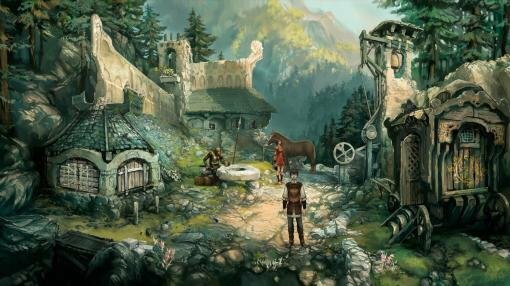 It feels good to see that people that are still creating Adventure Games (and good ones at that) also agree with the importance of this element when crafting these different worlds. Great stuff as always. Love this series.